OCR technology has been applied for some time, range from digitizing paper files, reading image-based contents to real-time translation. And due to its wide application, the OCR language is not only limited to some mainstream languages, the needs to do OCR on files with minority language are growing, such as Arabic OCR, Spanish OCR, etc. As for Arabic OCR, due to the language itself, the top concern is the OCR accuracy. Well, being demanding, we finally pick some best Arabic OCR software or online free services for our users, no matter you are a Mac user, Windows user or Android user. Arabic OCR Software VS Online Arabic OCR? Users who prefer Arabic OCR software are aware of its great benefits, in terms of simplicity, safety, efficiency, accuracy, even additional features. These programs can direct the least efforts to perform a successful Arabic OCR. Users who use online free OCR services, as you may doubt, instead of choosing for being free, they choose online free Arabic OCR for the sake of using Arabic OCR not often, requiring no installation. Though the file size limit and unstable OCR results may annoy them some times, they decide to use online free service as expedient. So, it is all you decision to do Arabic OCR. Want things professionally done? Go to a desktop OCR program. Want things simple and once? Use online free OCR services. It takes several years for OCR technology to evolve, and with a deep look into the OCR accuracy, a large quantity of OCR programs has failed in the game. All those still remain popular in the market are winners. But, today we are going to pick the best Arabic OCR from best for Mac users. 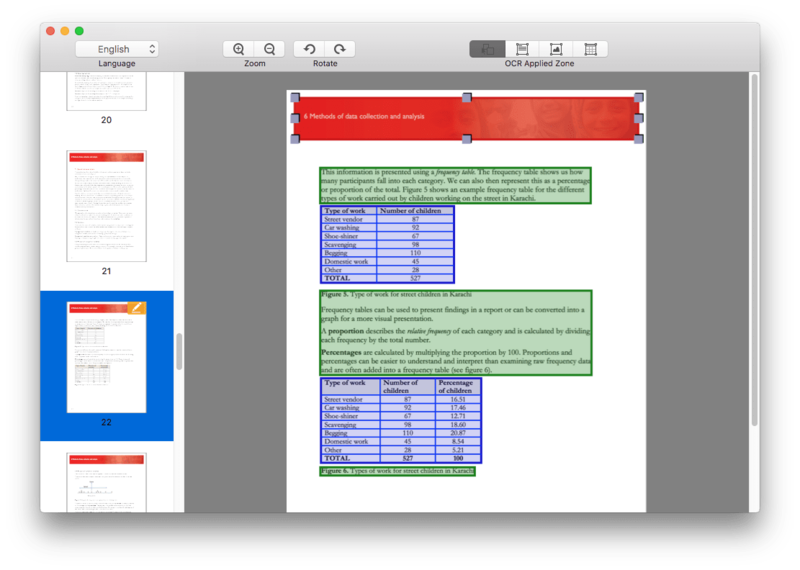 As a mac PDF tool, Cisdem PDF Converter OCR outperforms its contenders on the diversity of input files (native PDF, scanned PDF, protected PDF, images), of output format (16 types), also on OCR accuracy and extended features to create PDFs, all with a pricing of $49.99~$59.99. Yes, the pricing is more like a surprise for mac users. As you may have noticed, few OCR tools are given by such an affordable price, but bring good results. However, Cisdem is. Support 200+ languages, such as Spanish, Japanese, Chinese OCR, etc. How to Do Arabic OCR on Mac? Step 1Drag and drop Arabic file in PDF or image to the program. After you have installed the free trial of Cisdem PDF Converter on your mac, go to the PDF Converter, and drag&drop to add files. Your Arabic file can be a PDF, an image(JPG, PNG, BMP, GIF, TIFF). Also, you can batch OCR files. Choose the page range if you just want to convert specified pages. Turn OCR ON and choose file language as Arabic. For more accurate OCR, you can click the "Settings" icon. You will notice that the OCR applied zone are marked as Texts, Images or Tables in different colorful areas, you need to check if all OCR applied zone is marked correctly, if not or improperly, manually adjust (deleted the mark box first, then click on one of the icons under OCR applied zone, now you can drag a mark box to select all zone you want to be marked as the format you prefer). For example, if you want to output a part as table, remove the mark box in this zone, click on "Mark Tables" in the OCR applied zone, then drag a mark box to select those contents you want to mark as Tables. You can resize the mark box by dragging its corners. Click “Convert” to start doing OCR on Arabic files. Then find the Arabic file in output folder. Unfortunately, Cisdem doesn’t offer a Windows version and we spend another hours to finally pinpoint the best Windows Arabic OCR program---ABBYY FineReader. ABBYY FineReader is absolutely the big boss in this filed. It integrates all the features needed for a PDF management into single one pack, including editing, converting and comparing. Impressively, each feature of ABBYY FineReader has won a universal recognition from its users, particularly about its OCR. When doing OCR, it offers 2 great tools to enhance the accuracy, area control and smart image preprocessing. Additionally, it is one among few suppliers to allow doing OCR on scans by connecting to a scanner. Yet, it will take some to get familiar with this tool, it is quite complicate for beginners, but as your skills and needs grow, you will be able to well grasp all its powerful features. How to do Arabic OCR on Windows? Add file to ABBYY FineReader. ABBYY FineReader offers a 30-day free trial, once you have installed the program, launch on your computer and click the Add icon to import files. Tweak for accurate OCR. Once the file is ready, the Recognize processing starts, the contents will be controlled in different box, make sure it is recognizing correctly. Also, you can edit the image for more accurate results if you have uploaded an image file. Export PDF as editable formats. Click the “Save” button to choose an output format. If you are, as we mentioned above, not working on Arabic OCR very often, online free Arabic OCR service deserve a try. Here we got 2 options for you, i2OCR and Convertio. Convertio is picked as the top choice not only due to its relatively higher OCR accuracy, but a series of free service to customize the Arabic OCR. First, you can upload files from computer, Google Drive, Dropbox or even with a URL. Also, you are allowed to add other languages that applied in your file to recognize properly. Still, it offers more output options and enables partial OCR on specified pages. It is easy to use, you just need to upload you file, then do a CAPTCHA test to verify you are not a robot. Once OCR finishes, you can click the “Download” icon export the image as Text, Word, PDF or HTML. Also, you can choose to translate the Arabic file with Google or Bing, even to view the file with Google Docs. But as the formatting after OCR, it messed a little and manual adjustments will be necessary. As more and more users move to work on their mobile devices, apps designed to do Arabic OCR are really saving us. After going through about a dozen of Arabic OCR apps, we found Text Fairy is absolutely the one does as good as commented in Google Play and mainstream download platforms. Text Fairy, as its name tells, is an Android app to convert images and screenshots into editable text, so you can export as PDF, or copy and send to another apps. It recognizes more than 50 languages, including Arabic. For highly accurate OCR results, it allows users to crop the image, fix viewpoint and straighern the text. Everything that can be captured under your lens, can be OCR-ed by this app. Download and install this Arabic OCR App on your Android phone, run it. Choose an image or capture the text image with your camera. You can crop, rotate. Click “Continue” to start automatic OCR recognizing. Then choose the editable text after OCR, copy or send to other apps, or tab to export as PDF. Nowadays, performing OCR on files, or Arabic files is not that tricky. The key is to find a tool serving for your purpose, if you want accurate results with least efforts, professional desktop OCR program is the never-fail option. Other wise, try those online free ones, but giving it a second thought. Scanned documents take a great part of our paper work in office, and often we need to edit a scanned document to make changes. Here’s the ultimate guide to show you how to edit a scanned document on Mac and Widows.